If my colleague Dayn Perry has taught us anything — besides that drinking in the AM isn’t a crime or anything so shut up everyone I’m not an alcoholic — it’s that everything we love will die. 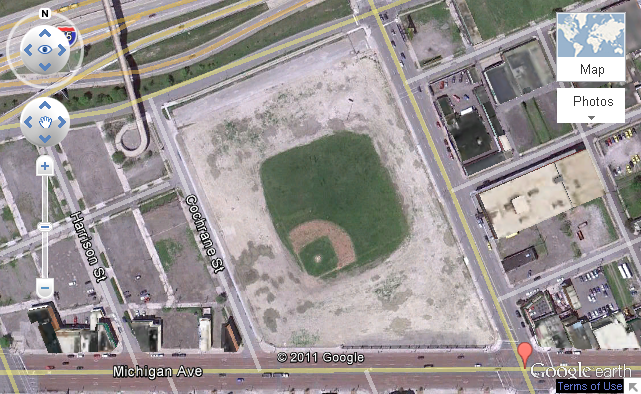 Confirming that notion is this image, courtesy Google Earth and entirely embiggenable should it have been clicked, of Detroit’s Tiger Stadium as it looks today. We hoped you liked reading The Site Formerly Known as Tiger Stadium by Carson Cistulli! I would say that the image is only semi-embiggenable. I would also say that I road-tripped (as opposed to regular tripped) to see Tiger Stadium in September of it’s final year as a ball park. It’s sad to think that that park could be to the Tigers what Fenway is the Red Sod or Yankee Stadium is the Yankees, a shining example of baseball’s history in the modern world. Not to mention a cash cow (as opposed to a regular cow).